Nebraska outside linebacker Breon Dixon is one of over 50 newcomers to the Nebraska roster for the 2018 season. Just like many of his teammates, he finds himself in a battle for playing time as the level of competition has been raised across the board in Lincoln. 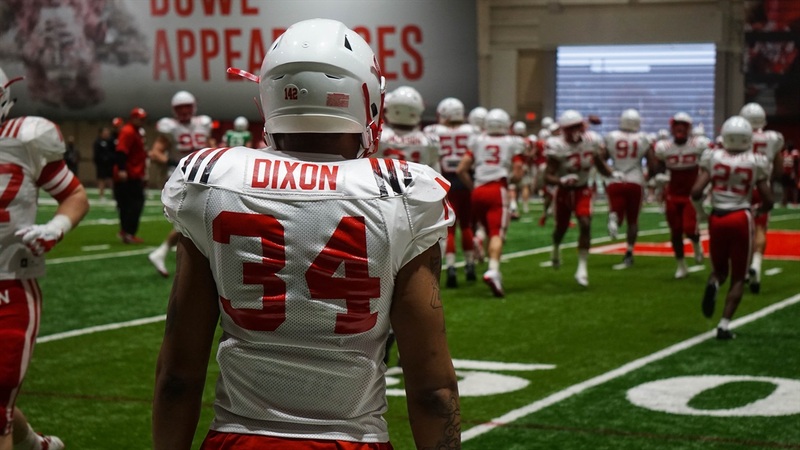 Dixon has been working at both field and boundary outside linebacker during his time with the Huskers. He has the versatility to play either position, which will help him find snaps this fall. However, it's not just about playing time for Dixon. It's also about being a good teammate and what he can bring to the table to help the team get better. And the sophomore from Loganville, Georgia, has taken the coaches focus on the team's mentality to heart. “It’s not really even about me at this point,” Dixon said. “Of course I want to bring speed, physicality and swag. That’s something I like to do. I like to play with an attitude and an edge. That’s what I try to make the guys do that are playing around me. I try to keep that up and talk to the guys, keep the energy up. That’s what I feel like I can bring. I can bring that edge and the best out of the other guys around me. If I am on the field, I’m constantly in guys’ ears. Outside linebackers coach Jovan Dewitt has seen Dixon putting in the work to improve. With time, he hopes Dixon will grow in his role and the team will follow his lead. “I think he’s working on it,” Dewitt said. “Here’s the thing about it with Breon and we have sat down and talked about this before, obviously he plays really hard and has a lot of passion when he plays. His role now has to be being more consistent with that. He has to be able to pull people in that direction. It doesn’t work if you are doing that on three plays and not on the fourth play. It has to be an all the time thing. Both coach Scott Frost and defensive coordinator Erik Chinander have both spoken about the need to flip the culture and the mindset on the team. Both have noted strides in that area but acknowledged the improvement still needed. Dixon says that team building activities and bringing in former players to speak has helped in that regard. It's a work in progress, but Dixon has seen the outside linebackers starting to become more consisten with their energy and passion. Part of that is never giving up, even when a play doesn't go the intended way. “At the end of the day you think, ‘He might whoop my tail this play but on the next one I’m going to get him and whoop his tail the next play.' So it’s that never quit mentality. That’s what I have," Dixon said. "I may not be the biggest but any time a tackle or tight end comes and block me, I may lose a rep but I’m going to get up and go harder the next rep just to make sure. With so many new faces on the roster and competition galore, it sounds like the Huskers are heading the right direction. At least at outside linebacker.